Your upgrade cleared? Don’t forget to pre-order your meal. I’m fortunate in that many of my recent upgrades have been clearing 24 to 48 hours before my flight, and on many of them I’ve had the option of pre-ordering my meal. I just keep forgetting to do it! Last year, American introduced “Entrée Reservations“ on a few of their routes and they’ve since expanded it to include most of their flights to major cities. Pre-order meals are only available for passengers traveling in the First and Business Class cabins, but I’ve been on a few flights where they’ve offered AAdvantage Elite customers traveling in the main cabin, the option to participate in a beta test and pre-order a buy-on-board sandwich or salad. It works really well and it means you no longer have to worry about FEBO. When my upgrade clears I always check my reservation to look at my seating assignment but I keep forgetting to pre-order my meal. So if you’re upgrade clears more than 24 hours before your flight, check your reservation to see if “Entrée Reservations” is available. Yesterday I missed the cutoff my 2 minutes – doh! I’m seated in row 1 today on an odd numbered flight from DFW to California, so that means I’ll be among the last to choose my meal. It’s a good problem to have, so I’m not complaining, but I wonder….will I have the Chicken Pear Salad (which is pretty tasty) or the Grilled Shrimp and Cheese Grits (never had it)…. I’m hoping for the salad, but it will probably depend upon whether the flight has more Californians or Texans travelling in the First Class cabin. I have found that the FAs do not always have a record of which passengers have pre-ordered meals. In fact, this has happened on two of the three flights in which I have used this service. Are all of us readers supposed to already know what FEBO means? FEBO = Front Even, Back Odd. What that means is, if the flight number is even, the flight attendant will take food orders from the front. If it is odd, from the back. Oh, well. I’m either getting Roast Beef Wraps or Buffalo Chicken Salad. FEBO – Front Even Back Odd. Even numbered flights food service starts in front of the cabin. On odd numbered flights, service begins from back of cabin. The last few flights I was on, the FAs were not even aware of this. So I guess at some point, after all [or most] of the kinks are worked out with the US/AA merger, we can expect the official elimination of FEBO? @ Gary Steiger – Sorry I forgot to add the hyperlink. A big hat tip to The Flight Deal and Segments for covering for me! @ Miles – I had that happen too last year when it was still in beta, but I’ve had much better luck since then (at least when I can remember). 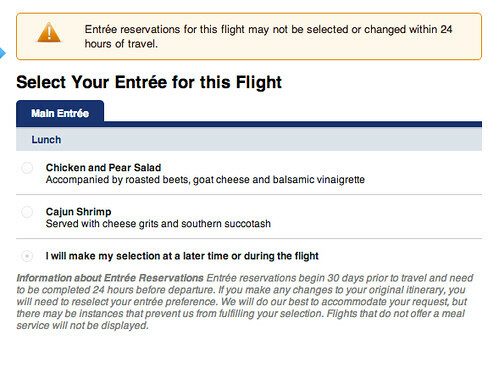 @ MaxM – US Airways also offers pre-order meals. so it could be that because of technology FEBO will eventually become (mostly) a thing of the past. Had the shrimp and grits today, was really good! !